At Jontay, we stock many different colors and sizes of nylon webbing, polypropylene webbing, cotton webbing, and poly-elastic webbing. 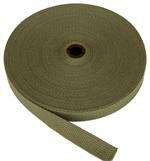 We also carry 4-panel polyester webbing. Our webbing is used in a diverse listing of products including: military, belts, tents, apparel, luggage, tote bags, underwater diving gear, backpacks, shoes, furniture, helmets, gloves, life jackets, horse halters, dog leashes, sleeping bags and more. Nylon Binding is a commercially-made, low-cost, ultra thin ribbon material. Useful as binding or a finished outer layer of webbing. Nylon Webbing is a strong and durable type of webbing, commonly used in making sports products, pet leashes and collars, luggage straps, and safety belts. Jontay offers many styles of mil-spec nylon webbing: Mil-T-5038 Grosgrain, MIL-W-17337, A-A-55301, Mil-W-5625 Tubular, Mil-W-4088 and Mil-W-27265. Polypropylene webbing is similar to the nylon webbing, but it is lighter, less expensive, and easier to sew. Waterproof and does not absorb dirt or water. Jontay is a distributor of wholesale narrow fabric cotton webbing and cotton belting for handbags and totes, belts and straps. Jontay offers both nylon elastic and woven polyester elastic webbing. 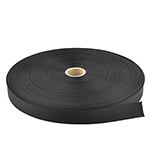 Jontay offers a 4-Panel Seat belt polyester webbing in black in 1-1/2" and 2" Widths. 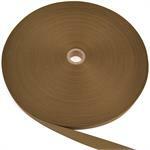 Please note that in wholesale quantities, some webbing rolls may contain taped or pinned splices. Splicing is done to reduce wasted material and usually only occurs once in a roll when it does happen. However, if you require webbing to be free of splices, please specify that in the customer notes section during the checkout process.